A Super-Earth has formed. The threats the Super-Earth will be facing are real. Everything in this system (the dissipating disk, the cooling planet, and the radiating star) has evolved to kill the atmosphere of the planet. Every single decision the planet makes will be life or death. If the atmosphere is going to survive this, the planet must realize that with too much mass, it could keep growing into a gas giant like Jupiter. With not enough mass, it may not accumulate much of an atmosphere. And if it gets too hot, it could lose its atmosphere completely. Do you know where we are? This is a Super-Earth – a rocky planet more massive than Earth, but much less massive than Neptune. The upper size limit of a Super-Earth is about 1.6 Earth radii, above which most planets are not rocky. Figure 1. Size comparison of Super-Earth COROT 7-b between Earth and Neptune. Image Credit. Super-Earths can have SUPER atmospheres! While the Earth’s atmosphere comprises just a millionth – or 0.0001% – of the Earth’s total mass, some Super-Earths are not as dense as Earth. To explain their measured masses and radii, some of these planets must have heavier atmospheres that constitute between 1 to 10% of their total mass. While previous studies show how the planet can build up such a massive atmosphere, the authors in this work take the atmospheric evolution a step further by also modeling atmospheric mass loss to see how low-density Super-Earths close to their stars are capable of retaining their heavy atmospheres. Before studying the processes that conspire to strip Super-Earths of their atmospheres, the authors first model how their atmospheres accumulate to begin with. Massive enough planets can build up an atmosphere in the first few million years of a planetary system by accreting gas from the surrounding protoplanetary disk before it dissipates away. To end up in the atmosphere, the gas must fall into the region around the planet called the Hill sphere – where the planet’s gravity dominates over the star’s gravity – or else the gas will never be bound to the planet. Additionally, the gas must fall further into the smaller region called the Bondi sphere – where it is moving slower than the planet’s escape velocity – or else the gas will be moving too fast to accrete. A fully formed planet can initially accrete a small amount of gas (just 0.1% of the planet’s mass) to fill up its Bondi sphere very quickly. With this region filled up, the planet can no longer build its atmosphere without some help. Fortunately, the atmosphere is not static and it helps itself by cooling down over time. Since the atmosphere is hotter than the surrounding disk, the upper atmosphere will slowly cool by radiating energy away. Once it cools, the atmosphere must become denser in order to maintain its total energy. This allows it to accrete more gas. 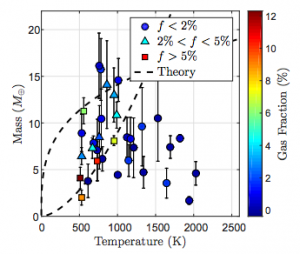 The authors find that a cooling atmosphere can accrete about 1 to 10% of the planet’s mass in gas, enough to match observations of low-density Super-Earths – that is, if the planet can hold onto that gas. The authors then continue their model by incorporating the effects of the disk, the planet, and the star that are trying to deplete the atmosphere. Even after the gaseous protoplanetary disk dissipates, the atmosphere continues to cool down. Only now with no more gas to accrete, the atmosphere must shrink to become denser, causing a thicker atmosphere to hurt itself by cooling. As the heavier lower atmosphere is cooling down, it releases enough energy to expel the lighter outer layers that are no longer supported by the pressure from the disk. This prevents any close-in Super-Earth from having a thick atmosphere and begins its mass loss. Light atmospheres that make up less than 5% of the planet’s mass lose mass faster than the time they would take to completely cool down. As a result, none of these light atmospheres can survive. Heavy atmospheres fortunately cool down much quicker. After no more than a billion years, the atmosphere will stop cooling and in turn, stop losing mass. The heavy atmospheres have survived! As the planet tries to destroy its own atmosphere, the star also joins in on the fun by heating the atmosphere with high-energy UV photons from its blackbody spectrum. This prolongs the time it takes for the atmosphere to cool and further constrains which heavy atmospheres will survive. The planet’s mass and temperature play key roles in determining whether it becomes Super-Earth sized and whether the atmosphere is appropriately heavy to survive. 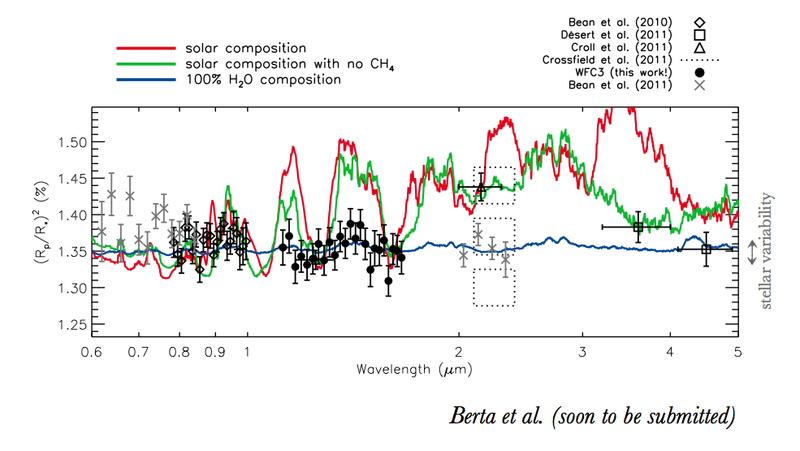 The authors use their model to determine the ranges of masses and temperatures a planet needs to form a Super-Earth with a surviving, substantial atmosphere, which are shown in Figure 2. Figure 2. The allowed mass range at a given temperature for a Super-Earth to form with a retainable atmosphere. (For example, if a Super-Earth has a surface temperature of 1000 K, it should be capable of retaining its atmosphere if it has a mass between 9 and 14 times the mass of the Earth.) The triangles and squares mark Super-Earths with heavy atmospheres. The circles indicate Super-Earths with lighter atmospheres. Their results match up rather well with the known Super-Earths. Hardly any Super-Earths below the minimum mass curve have a substantial atmosphere. As expected, the planets with relatively heavy atmospheres (triangles and squares) fall between the two dashed lines. Interestingly, not all of the planets between the lines have substantial atmospheres. This may be due to the effects of giant impacts also conspiring to deplete these atmospheres. All in all, the authors hope that the simplicity of their model will make it a good starting point for future work to incorporate additional effects from more detailed disk models. Despite the agreement with observations, they acknowledge that more rigorous models are needed to understand how Super-Earths can accrete and retain their atmospheres.